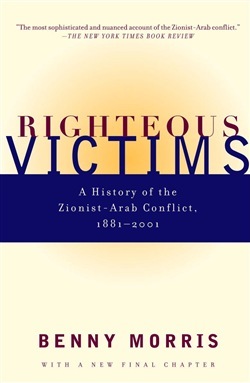 Righteous Victims, by the noted historian Benny Morris, is a comprehensive and objective history of the long battle between Arabs and Jews for possession of a land they both call home. It appears at a most timely juncture, as the bloody and protracted struggle seems at last to be headed for resolution. With great clarity of vision, Professor Morris finds the roots of this conflict in the deep religious, ethnic, and political differences between the Zionist immigrants and the native Arab population of Palestine. He describes the gradual influx of Jewish settlers, which was eventually fiercely resisted by the Arabs during the decades of British Mandatory government following World War I. The establishment of the State of Israel in 1947 - 48 gave the Jews a homeland in the wake of the Holocaust, but the ensuing flight of the Palestinian Arabs shattered their society and led to the birth of a festering refugee problem. Morris describes these epic events and the Arab onslaught that followed, as he does each of the subsequent wars (in 1956, 1967, 1973, and 1982 - 85); the Intifada of 1987 - 91, when the Palestinian populace of the West Bank and Gaza Strip rebelled against Israeli rule; and the rise of fundamentalist religious movements on both sides of the barricades. Tracing the successes and failures of politicians, generals, and diplomats in both camps, he regards their actions and plight with accuracy and empathy, drawing on archival materials, memoirs, and secondary works to give a vivid account of each major military encounter--and of the vicissitudes of peace efforts from the post-1948 negotiations through the Camp David (1977 - 79), Oslo (1993 - 95), and Wye River Plantation (1998) accords. Mr.
Morris offers sharply etched portraits and illuminating anecdotes about the charismatic leaders who have been the chief protagonists of this contentious history, including Theodor Herzl, Hajj Amin al-Husseini, David Ben-Gurion, Anwar Sadat, and Menachem Begin, to name only a few. Righteous Victims ends with Mr. Morris's analysis of the current state of play, when the election of Ehud Barak as prime minister (May 1999) has opened the door to a renewal of negotiations between Israel and its Palestinian and Syrian neighbors. As the denizens of the Middle East set out to write the next chapter in this long and difficult struggle, Righteous Victims is essential reading: a monumental work of narration and explication for all who seek to understand the history of the conflict and the prospects for peace. Acquista Righteous Victims in Epub: dopo aver letto l’ebook Righteous Victims di Benny Morris ti invitiamo a lasciarci una Recensione qui sotto: sarà utile agli utenti che non abbiano ancora letto questo libro e che vogliano avere delle opinioni altrui. L’opinione su di un libro è molto soggettiva e per questo leggere eventuali recensioni negative non ci dovrà frenare dall’acquisto, anzi dovrà spingerci ad acquistare il libro in fretta per poter dire la nostra ed eventualmente smentire quanto commentato da altri, contribuendo ad arricchire più possibile i commenti e dare sempre più spunti di confronto al pubblico online.